I thought I would do a little update on this Fatherhood thing today in light of something quite hilarious that happened. For over a month now we have been giving our son an allowance for doing “chores”. Really things he should do anyway at 10, but it is an incentive and it teaches him how to save money for the things he wants, instead of having it handed to him. He brought home his book order yesterday from school and there is a Minecraft item in it that is almost 50 dollars. Honestly, I think within a few weeks he wouldn’t even bother with it. My wife the genius wins again with her idea. If he wants it, he will earn it. He has some allowance saved up. Today we were cleaning leaves and gutters on our garage and storage building. Now, I am deathly scared of heights. Anything more than 3 feet off the ground and I am likely to break out in an anxiety attack. I managed to clean the garage, because I only had to go up two steps on the ladder to reach the gutters. I can handle that. 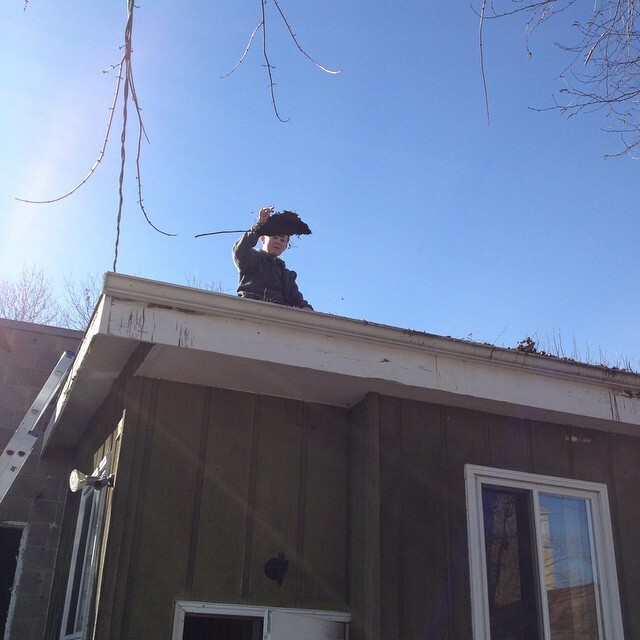 Our son comes home from school and is quickly talked into climbing onto the roof of the storage building to clean that gutter. All for the low low price of 30 bucks. As he mounts the ladder and makes his way up onto the roof, I am already feeling a panic attack creep in. I know he is an extremely responsible 10 year old. I am proud of him every day for the way he conducts himself. I just have this overwhelming fear now that he is about 12 feet in the air. Then the fun begins. He scoots within an arm’s reach of the gutter, small shovel in hand to use as a scoop to get the gunk out of it. As he begins to clean sticks, leaves and everything else out of the gutter, he says, “It looks like poop.” And down comes a clump of decaying leaf material that had clogged up the gutter. Then it got more hilarious as he makes a game out of being a poo flinging monkey and tossing down the clumps like some irate primate in a zoo. Barely 20 minutes and he is climbing back down the ladder as I steady it from below. I think I took my first decent breath once he was within reach of my arms should he have fallen. I love this poo flinging monkey. This entry was posted in Commentary on Life, Fatherhood and tagged Fatherhood, Life, love, monkey, proud, son. Bookmark the permalink.